How much would you risk to go home? That’s the question tens of thousands of Nigerians displaced by Boko Haram are grappling with as officials push for their return to a region many deem unsafe. In the camps and settlements of displaced people that crowd this city, the stories often begin the same way. The armed men arrived on motorcycles. Or they sprung from the flatbeds of dirt-streaked Toyota Hiluxes. Other times they were on foot, appearing as if from nowhere, machine guns slung over their shoulders with their barrels pointed skywards. They came to the town mosque. To the school. To the market. They went door-to-door, looking for men. Looking for boys. Looking for young girls. Everyone who could ran. Those who couldn’t, walked. They tripped over bodies. They hid in pit latrines. They followed the road or they cut a path through the forest. But they didn’t stop moving. They couldn’t. Over the past decade, nearly 3 million people in the Lake Chad region have fled their homes, most of them northern Nigerians escaping guerrilla attacks by the Islamist insurgent group Boko Haram. Scattered across camps and communities, they have become among the most agonizing reminders of the human toll of that crisis. Now, the country’s displaced have also become the centerpiece of a rising political drama. With national elections approaching early next year, Nigeria’s government has promised – not for the first time – that it is on the verge of defeating Boko Haram. And to prove that, officials say, they are going to send their constituents home. It’s too soon, some humanitarian groups have protested, arguing residents’ safety is being compromised by political goals. But to many of those residents themselves, the situation appears far murkier – home is a risky, but tempting, promise. Sure, they say, it could be dangerous, but it is also slowly breaking them to stay where they are. In the tenth year of a war with no end in sight, the idea of staying forever in a tented camp or a foreign city is for many as oppressive as the possibility of violence outside. After a decade of fighting, some 2.3 million Nigerians are still unable to return home, including more than 1.6 million inside Nigeria itself. Tens of thousands have become refugees in neighboring Cameroon. “We want zero camps, we want everyone to be able to vote in their home locality next year,” says Ya Bawa Kolo, chairwoman of Nigeria’s State Emergency Management Agency (SEMA). Such statements, however, have critics raising the alarm that politics are pressuring the government to bring people back to former rebel strongholds before it is truly safe. Nigeria’s national elections are still nine months away, but already the smiling faces of political hopefuls smile down from billboards across Maiduguri. Bright yellow tuk-tuks twirl around roundabouts plastered with posters for would-be legislators and governors. For President Muhammadu Buhari, who will run for a second term, defeating Boko Haram was one of his first campaign’s major promises. And although the Nigerian military has notched some major successes against the group since then, the insurgency continues to lash cities and towns across the region. Mr. Buhari, meanwhile, has been conspicuously absent here – most recently missing a forum of regional governors where he was the guest of honor. “He certainly feels pressure to redouble his efforts now because he doesn’t want to be seen as not fulfilling his campaign promise,” says Ibrahim Umara, associate professor of international relations and strategic studies at the University of Maiduguri. In early April, a convoy of government-owned American school buses painted green and white rattled out of Maiduguri, bound for the city of Bama, 50 miles to the east. The choice of Bama to begin the latest round of returns was deeply symbolic. The second-largest city in Borno, Bama has long been a weathervane for the government’s fight against Boko Haram. When it fell to the insurgents in 2014, it became proof-positive that Boko Haram could seize and hold a major city. When the Nigerian Army recaptured the city the following year, just two weeks before a national election, government officials pointed to the victory to show that the tide had turned. the first convoy, about 35,000 people returned to the city, according to figures provided by the United Nations refugee agency, UNHCR. Going home – to what? Babagana Kassim was among them. Three years ago, Mr. Kassim arrived in Maiduguri with nothing after fleeing an attack on a mosque where he was praying in Bama. He didn’t have his two wives or his nine children. Not his prized maroon Volkswagen nor the wad of naira notes he kept buried in the sandy dirt behind his house. Not even his shoes. “I was broken then,” he says. Slowly, he says, he built his life back. Three months later, his family followed him to Maiduguri, and a few months after that, Kassim, who had been a shopkeeper in Bama, opened a small store selling snacks and household goods. But the thought of going home was never far from his mind, and when he heard on the radio that the government was beginning relocations back to Bama, he decided immediately to go. As soon as he arrived, however, he says something seemed off. “They were telling us the whole city was rebuilt but when we arrived, but it was maybe one in three buildings,” he says. And the sudden influx of people had strained humanitarian resources. Food distributions kept running out before he got to the front of the queue. Then, five days after he arrived, he was at the mosque for morning prayer when he heard an explosion. A suicide bomber had blown themselves up nearby. The next morning, it happened again. After the two attacks, the local government halted the returns, saying they would only continue when the security situation was better. Still, most of those who returned to Bama have stayed, according to UNHCR. But in the camps in Maiduguri, many of the displaced still think returning home before the elections is a far-fetched idea. For Talatu Akawu, who lives in Bakassi and comes from the nearby town of Gwoza, it’s no longer her top priority. “Our house was destroyed, so as of now, we don’t have anything to go home to,” she says. But Maiduguri sometimes seems little better, she says. On a recent afternoon, she was hanging her laundry outside the tarp tent she shares with her family when she heard the familiar pop-pop-pop of gunshots in the distance. 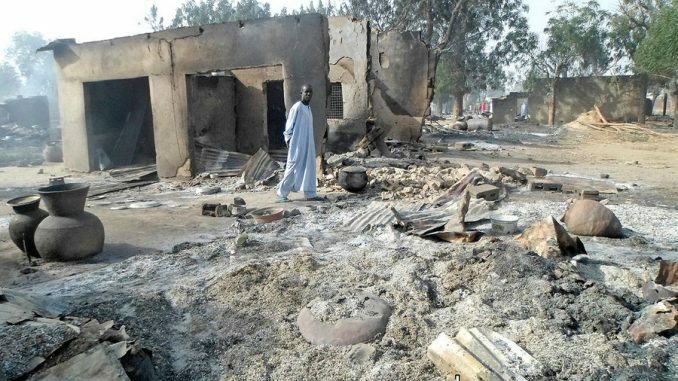 It was Boko Haram, attacking a neighborhood nearby.